Putting a date on a pair of Dynasonics? Is there anything in particular that would indicate the date of a Dynasonic pickup? These look like standard 50s Duo Jet. The top of the casing looks rounded from your pics. That suggests a post-Gretsch Dearmond. Do you have a 3/4 view from the sides? Also (if I'm not stating something you don't know already) vintage Gretsch came in one size only, 7/16" high. Post Gretsch (with the rounded tops) came in 7/16" & 9/16". Here's a link to a big fun total DeArmond site: musicpickups.com. It looks like someone might have shortened the height adjustment screws; was that the case with all of the 2000s that were installed in Duo Jets? If so, that would provide a period of time starting with 1953 when the Duo Jet was introduced. Anyone know when Gretsch stopped production of the Jets with the DeArmond 2000? That would at least narrow things down. The link that lx posted seems to be the best reference so far. I think the screws were cut with two things in mind. 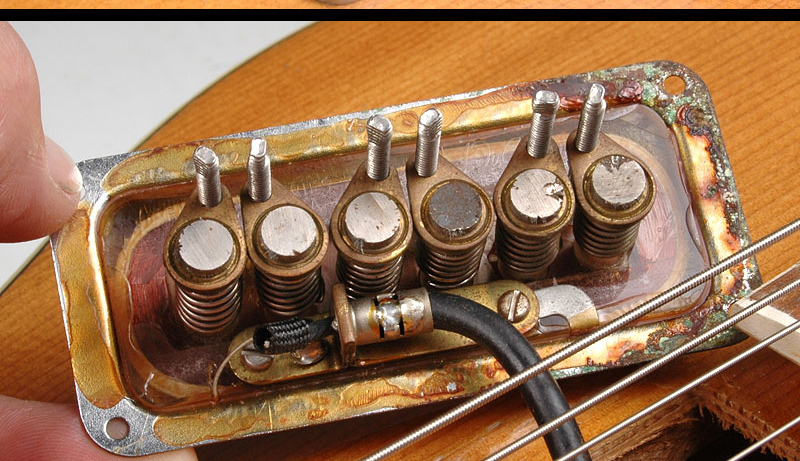 One: to crimp the end, so they can not be unscrewed all the way and drop the pole piece into the guitar. All versions I have seen have the crimped/cut ends regardless of length. And two: shorter version were for shallow body guitars like the duo Jet. Any idea of “ actual” selling prices on these style pickups? Thanks Paul. That would be a great way to identify these. I also seem to see confirmed early 50s models have a brown wax or glue holding the frames on to the bobbins. Where these for example do not have that goop. Not sure when that stoped. Several years ago, there was a guy that had numerous NOS units. He bought them by the box from music stores that were closing. All were from the 60's. He would put a few of them at a time on eBay for around $225-$250 each. I have several more pics of Martin style and they also have red wires. Hmm, wonder if that's by chance or some meaning to having it red for Martin. I think I bought a couple from him years ago. They're fantastic sounding, I have them on a DSV. Much fuller than 50s Deaarmonds, each is around 13k. What you're looking for to ID a Gretsch-era DeArmond is not just a white wire, but a tiny white cloth wire. Later ones also used a white plastic wire. And it should read somewhere in the 9k-9.5k range. They got hotter later. Thanks Afire. That helps. I had read just the opposite on the output being hotter earlier. So this is certainly helpful to identify Gretsch era pickups. I went ahead and bought the pair I showed in the first post as I think the deal was certainly fair based on what I see others going for (as well as modern reissues). For my next project I think they will be just fine. Seems the ticket to 50s Gretsch era is thin White bobbin connection wire and a gooped back. Thanks Afire. That helps. I had read just the opposite on the output being hotter earlier. I've read that too. All I can say is that I've measured about 10 known original Gretsch DeArmonds, from '52 to '57, and all of them were very close to that 9k-9.5k range. Mabye a couple just a hair above or below. I will take that info as fact. Thank you. Correct Afire! I have bought three 50s DeArmonds. All three has the white bobbin wire and measure between 9k-9.6k. Not super hot but hotter than stock Dynas that are around 7k-7.5k. I bought a pair from him too. I installed them in a DuoJet that I had at the time. I thought that they sounded fuller and smoother than the RI Dynas too. I don't remember the readings that I got from them, but I posted results in a thread about single coil impedence ratings. Tried to find that thread, but couldn't. May have been lost in the Big Crash. There was a ton of info on what folks were getting for readings on various eras of Dynas.